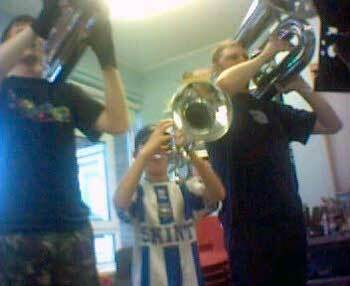 Sven Parris, percussion instructor for 6th Hove (UK), sent in this one. "Apologies for the quality of this picture -- it was taken on a mobile phone! This is Dom, a 9-year-old mellophone player from the 6th Hove B-corps standing in the arc with the A-corps contra line at a March camp. He was one happy young man! We often include the young recruits from the B-corps in joint rehearsals -- it gives them (and us!) a great buzz! Drop by our Web site and say hi!" Thanks Sven! We're running out! Send us more of your Forzato submissions!